Technology startups are more common than many people think. Once considered alien and high-risk, they have made their way into the $220 trillion international property market and are now poised to disrupt it, much to the benefit of ‘newcomers’. Today, there are 1500 real estate tech companies. Startup culture and pioneering technology, such as blockchain, are the key drivers of their business. Let’s take a moment to explore the emerging relationship between the global real estate industry and the tech-startup world. With the startup boom, businesses began to cater to millennials and Gen Z workers by offering better working conditions and a stronger work-life balance. The new “do what you love” culture gave rise to the “shared” office model and co-working companies such as Regus and WeWork. These have become hubs of startup activity and managed to raise billions of dollars to expand their real estate footprint. Now, the co-working spaces are branching out into housing, poised to capitalise on the increasingly expensive problem of finding an affordable apartment in a bustling city like New York or Boston. WeLive, operated by WeWork, together with Common, Bedly and Ollie, are making this possible by offering an updated version of the co-living model, which incorporates not just plenty of communal and affordable living space, but the “live better together” framework for networking. Aiming to transform the real estate market by catering to community-minded people with an entrepreneurial bent, co-living companies provide the micro luxury of moving within their housing networks without locking into long term rental agreements or having to deal with roommates. Both the co-work and the co-live businesses offer the so-called “frictionless transaction” experience, integral to the tech-startup culture, and a long list of real estate technology companies follow their lead. The rise of Web 2.0 has lowered transaction costs and opened up new ways of renting, buying and selling property: Home61, Redfin, Compass, Zillow, and a myriad of other real estate startups, have set out to implement their own versions of the technology. From search to value prediction mechanisms integrated into online services and intellectual marketplaces, technology startups have disrupted the market on a hyperlocal level by providing investors with data-driven insights to make informed decisions, while cutting out the middleman and saving thousands – sometimes tens of thousands – of dollars per transaction. Today, blockchain, a digital ledger technology, is emerging not only as a cost-cutting opportunity, but also as the new industry standard for next-generation digital transactions in the real estate market. Thaler.One, a blockchain-based investment fund, plans to capitalise on both traditional and alternative real estate asset classes by introducing a decentralized platform that will allow small investors to buy into real estate, predominantly located in the EU and the UK, with the lowest possible transaction costs. The fund will be professionally managed, and the technology behind it will ensure borderless and secure transactions. The decentralized platform will be powered by Thalers, blockchain-based security tokens which offer transparent legal ownership of real estate assets. According to the founders, Thalers will be issued in compliance with EU regulations and regulation D in the US. To date there are some US based real estate crowdfunding platforms, such as Cadre, Realty Mogul, Realty shares. 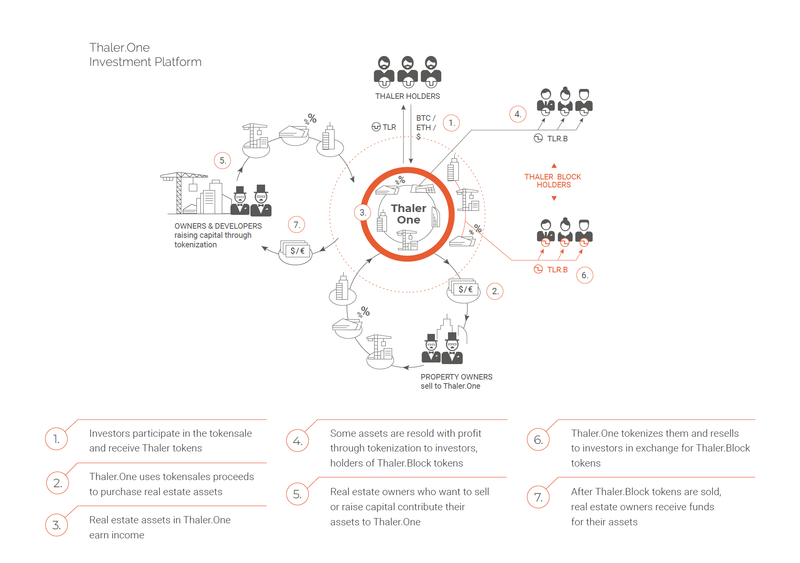 Thaler.One is introducing the same business model powered by blockchain technology into the European real estate markets. The enterprise is set on opening up international real estate to a new global investor class, including individuals in countries and locales with limited or restricted access to traditional collective investment vehicles. To raise funds for the venture Thaler. One will conduct a pre-sale, commencing early April, 2018. The “Apple-fication" of the global real estate industry has started. Technology startups are applying Apple's vision to reimagine the way in which housing operates, and aim to open the international property market to more private investors. However, It is impossible to tell if blockchain, in particular, becomes the new industry standard for real estate transactions. The potential is there, but only time will tell how the industry in general will adapt and evolve in the next several years.